Tue, Dec 31, 2013 - 7:42pm | Mary Hartman Board Game?!? Thu, Dec 12, 2013 - 7:55am | And here I thought blogs were suited for non-tech types. . . I can't begin to imagine how a game could be made out of this series. I think I'm going to have to get a copy if only for curiosity's sake. Has anyone else actually played this thing? The box says "fun for all ages" so it must be true. Well, Mary would believe it, at least. The object of this game is to be the first player to complete 2 MH, MH episodes. 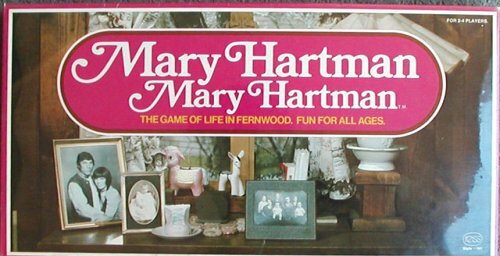 There are four Mary players and then one each of Grandpa, Loretta, Tom, Merle, Cathy, Charlie and Martha. It is very cool! I saw that same description, that the object was "to complete 2 MH, MH episodes". But what on earth can that mean??? I guess I'll find out in a few days-- I already ordered a copy! Pink Xanax Balls Recipe Xanax And Valium . Xanax Water Based Xanax Makes Me Lazy Xanax Blood Test Xanax In Costa Del Sol Xanax Bars On The Liver Mixing Lorazepam And Oxycontin Alprazolam Xanax . After Adderall Xanax Dosage Xanax Comparison Mix Darvocet And Xanax buy xanax online. Reducing Xanax Withdrawal Symptoms Usual Dosage Of Xanax Xanax Help Sleep Anxiety Disorder Xanax Structural Formula Grapefruit Juice . This has been on my To Own Someday list for months. Also, I'm in love with the MH font. All those curlicues! In order to avoid the reviews I should be writing.